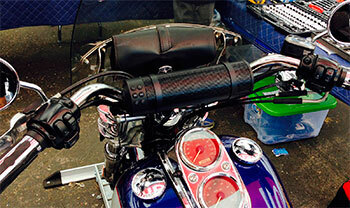 Motorcycle audio systems are a challenge unlike any other. Not only do the systems have to sound good, they have to sound good at very high volume in an open-air environment with very little space to install speakers and amplifiers and they have to be built tough enough to handle vibrations, excessive heat, rain, dust, and more. If your motorcycle doesn’t have a fairing, it’s almost impossible to install a decent sounding audio system without compromising the cosmetic look of your bike with custom modifications or ugly bolt-ons. Most owners of non-fairing motorcycles probably give up on the idea that their bike will ever include music unless it’s coming from a car beside them at a stoplight. #1 – What are you going to use as an audio source? If you want to listen to the radio while cruising down Rt. 66, you are probably either going to use an in-dash type unit that could have CD/MP3/AM/FM/AUX type capability or maybe you have more data than you know what to do with on your cell phone plan and you plan to stream music from your smartphone through apps like Pandora or iTunes Radio. You could also do this with a traditional in-dash type radio with a 3.5mm Aux input. If you want to use your phone for audio, most people don’t want a cord attached to their bike on one end and their phone in their pocket on the other. The cord flaps in the wind and just gets in the way in general. For these people, a Bluetooth connection is best. The phone can stay in your pocket and stream music wirelessly to the source unit. If you’re worried about having a data signal for apps like Pandora, you can also play music files stored on your phone via Bluetooth. This way, you aren’t using data on your plan and you don’t even need a signal when you’re traveling through the Black Hills of South Dakota. #2 – What speaker sizes and locations do you have to work with and what space is available for an amplifier? 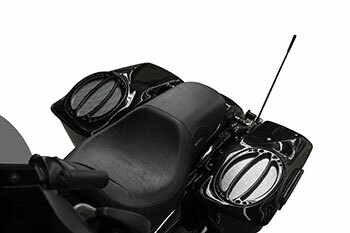 If your bike has a fairing, chances are you already have some speakers and a source unit in it. Depending on how old your bike is, the source unit may or may not be Bluetooth capable. Sometimes a simple Bluetooth add-on and a speaker upgrade can drastically improve your ride. 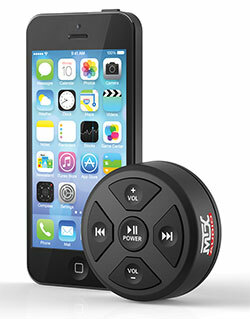 A product like our MUDBTRC can add Bluetooth to your existing in-dash radio. It can be installed on your bike by cutting a hole and flush mounting it for a factory look or can be surface mounted if you don’t want to cut any holes. It also comes with a handlebar mounting bracket if you don’t want anything touching your paint. 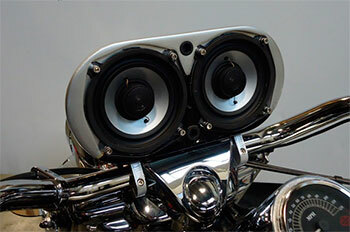 Replacing your factory speakers is the easiest way to upgrade your motorcycle’s audio system. Figure out what size you have (typically 4”, 5 ¼”, or 6 ½”) and look for speakers that are built to handle rain, moisture, UV rays, and the elements they will be exposed to during your rides. Full range coaxial speakers are typically your best option since they don’t have an additional crossover network to find room for and they offer as much frequency range as you can get in a single speaker. 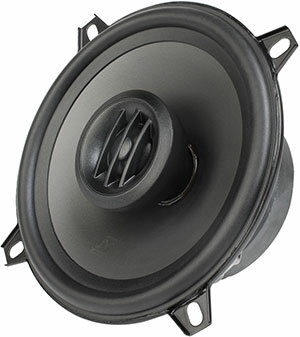 THUNDER52 coaxial speakers are great for motorcycle applications. The 5 ¼” speaker option (also available in other sizes) plays lower than most coaxial speakers and the pivoting tweeter design offers the ability to adjust the soundstage to direct the sound toward your ear. This reduces the amount of sound that gets lost in the open air. The polypropylene cone material is durable enough to withstand the elements and the shallow 2.25” mounting depth is ideal for fairings, which don’t have a ton of space for deeper speakers. Once you have your source unit figured out and know what size speakers you are going to be replacing and/or adding, all that’s left is to figure out how much power you need for your speakers and where you can install the amplifier. 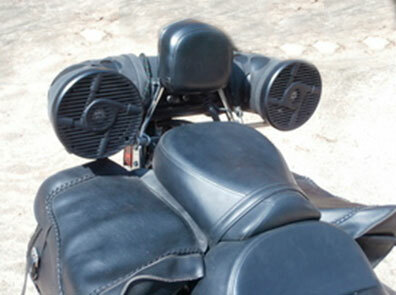 Typically, amplifiers for motorcycle audio systems with fairings are installed inside the fairing itself. But if you’ve ever taken apart your fairing, you know with headlight wiring, factory radio, headlight ballasts, and everything else that can be in there, an amplifier doesn’t have much room left to live in. 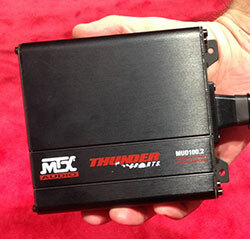 MTX Audio offers 3 different options of micro chassis (very small) MUD series amplifiers. 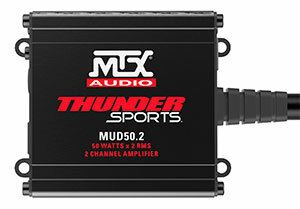 These amplifiers were designed with extra care and steps were taken in design and manufacturing to ensure durability when riding in rain, bashing through mud, or bouncing over boulders. Features such as conformal coated printed circuit boards that resist moisture and covers over the tuning adjustments ensure these bad boys can handle just about anything you throw at it. Even the integrated wiring harness is sealed from moisture and debris. The amplifiers are full range, Class D for efficiency, available in 2 and 4 channel models, and capable of 50 watts RMS up to 400 watts RMS depending on the model. The smallest chassis size is 3.64” H x 2.85” W x 1.73” D.
If your bike doesn’t have a fairing, your options are MUCH more limited. The easiest part is the source unit. The MUDBTRC can clamp to your handlebars and that piece of the puzzle is ready to go. But where are you going to mount the speakers? There are a lot of bolt-on options out there but all of them sacrifice cosmetics, sound quality, or both. You can bolt speaker pods to your handlebars but you still need a source and amplification. 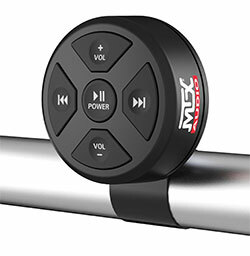 Besides… on what planet does it look badass to have bulky pods that stick out like a sore thumb mounted to your bars? You can mount speaker pods to your highway bar but most people don't have ears on their knees. If you have rear saddlebags, you could buy a custom lid with a speaker mounting location but you still wouldn’t have a front sound stage. We’ve even seen crazy homemade inventions with PVC pipe bungee strapped to the sissy bar. The point is, you want something that has sound output as close to your face as possible. This generally means the handlebars or the fairing are the best options. But how can you mount speakers and a source unit to your handle bars and even if you do, where are you going to find space to install the amplifier to power them? The MUDHSB-B is a great option for motorcycles without fairings. The sealed, all-weather enclosure mounts to handle bars 7/8” to 1.25” with 6 speakers (Yes… you read that right… 6 speakers) inside. Plus, it has built-in Bluetooth and NFC (Near Field Communication) technology for easy pairing to your Bluetooth enabled device. Better yet, it also has built-in amplification. Simply wire to the battery for power, clamp to the handlebars, pair your phone, and you are ready to rock. The handle bar clamps have 3-way adjustability to ensure they fit on virtually any style of handlebars. The best part is, you don’t have to worry about finding another location for ANYTHING! Everything you need to have your favorite jam rocking on your next poker run is in the MUDHSB-B. So when you want to add music to your motorcycle, whether you have a fairing or not, be sure to ask yourself those two questions. They will lead you to products that will meet your needs and you won’t be “that guy” with a bulky looking contraption that looks like a vintage Volkswagen part strapped to your bike.